The Kruger National Park is one of the best game parks in Africa due to the variety of game occurring there and the quality of its infrastructure and accommodation which makes it ideal for a self guided (self drive) safari. Double click your mouse on the map or use the controls in the top left hand corner to zoom in for a closer look at the Kruger National Park. In some cases you can magnify it so much that you can see cars on the roads and the roofs of the accommodation in the restcamp (if you look long enough you might even find an elephant or two). To help you get the most from this map I've added icons that represent the main restcamps, bush camps, luxury lodges, bush lodges, overnight hides, entrance gates, picnic spots, hides, dams & waterholes, lookout points, walking trails, airports, supermarkets , cultural/historic sites, toll gates, the top five wildlife spotting routes and the location of African Safari Journals. To help you plan your trip to the reserve, this calculator works out the distances between all the main restcamps and gates and will tell you how long it takes to cover that distance if you travel at an average speed of 25 km/h. That might sound slow but with a maximum speed limit of 50 km/h and the fact that you will be stopping regularly to look at wildlife, it's pretty accurate. If you want to see a large variety of wildlife, the Kruger National Park is hard to beat anywhere in Africa. Spotting the big five of lion, leopard, elephant, rhino and buffalo is a very distinctive possibility as well as kudu, impala, giraffe, wildebeest, zebra and loads more species. On the bird front you will be spoiled with a seemingly never-ending supply of eagles, hawks, water birds and a host of migratory and indigenous species to the tune of over 500 different varieties. Because the park is so large (bigger then the whole of Ireland) you can experience a number of habitats and ecosystems. You will very rarely have a safari here that will leave you disappointed with the wildlife you have seen. The rainy season begins in October and ends approximately in March and mostly consists of short, drenching thunderstorms. The remaining months from April through September are dry and pleasant with warm days and cold nights. 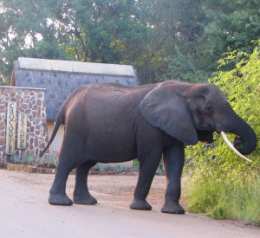 A walking trail in the Kruger park is an incredible experience. You get as close to Africa at its wildest as it's possible to come. The sheer size of the place. You can sometimes drive for hours and only see a few other cars go past. The tented camp at Lower Sabie rest camp. Watch elephants crossing the river from your front porch. The Lebombo 4x4 overland trail with unfenced overnight stops. Size: The Kruger Park is huge. It stretches for 350km (217 miles) from north to south and averages 60 kilometres in width which makes it bigger than Ireland. Most of the park is fenced so it is a self contained ecosystem. Accommodation: There are twelve main rest camps and additional bushveld camps spread throughout the reserve so there is no shortage of accommodation. The main camps are Berg-en-Dal, Crocodile Bridge, Pretoriuskop, Lower Sabie, Skukuza, Orpen, Satara, Olifants, Letaba, Mopani, Shingwedzi and Punda Maria. There are camping facilities in all the rest camps and also more comfortable accommodation in the form of permanent tents on platforms, huts/rondavels, bungalows, family cottages and guest houses.